Looking for different ways to increase the conversion rate of your E-commerce store in this coming holiday season? What else could be the better way then preparing your store for “Cyber Monday” with Orderwave online store management. 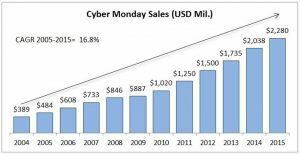 The term “Cyber Monday” is coined by Ellen Davis and Scott Silverman has made its debut on November 28, 2005. Thus, it has become a most popular day for the online shopping of the year. Why? Furthermore, It has been observed that on the first Monday after Thanksgiving, consumers are ready to spend money online. After observing the cyber Monday’s sales growth in 2015 and 2016, Adobe Digital Insights predicts that “online shoppers will spend $6.6 billion, 16.5% more than in 2016. Thus, an online growth of 9.4%”. Thus, Cyber Monday is the perfect time to elevate the conversion rates of your e-commerce store. With regards to this, you need to do few preparations to make your store ready for Cyber Monday. As we discussed above, consumers are ready to spend money online on Cyber Monday, so, this can bring a lot of buyers and online customers to your store. First of all, look for the load time of your website, if it is slow load time, the visitor may get frustrated and shut down your website. In order to avoid such situation, consider your website’s bandwidth and check with your web host to increase the bandwidth. In the past few years, we have seen that the numbers of mobile shoppers have increased tremendously as compared to those who shop from the desktop. According to ComScore report “Both desktop and mobile saw healthy growth rates, with mobile at 29% vs. desktop at 17%.” (Source – ComScore). Therefore, it is important for you to optimize your E-commerce store for mobile users as well. This is the most important tip you need to consider while preparing your store for Cyber Monday. Here, decorating website refers to as an identifying your cyber deals and planning for what and how you sell. For this, you need to identify and plan carefully that what products will be on sale and what special discount you going to offer to promote those products. To entice a large number of customers, you can also think to offer free shipping offer. Shopping experience matters a lot for earning good traffic and conversion rates. To improve this experience, you need to work on store navigation. This navigation works as a guide that gives the detailed insight of your store/website to your visitor. For attracting customer to your deals, you need to make simple yet enticing calls-to-action that are clearly visible. To entice your visitor to visit your site and take the call to action, you need to provide them with the hassle-free product search panel and checkout process. When it comes to publicizing your brand message or advertising your promotional deals, social media works best in spreading your words. In fact, in the second quarter of 2017, online orders were referred through various social networking sites had an average of $98.94. (Source – Statista). Therefore, use popular social media channels including Facebook, Twitter, Pinterest, and YouTube as well to advertise your Cyber Deals. Provide them with quality content of products, clear Hd images or GIFs or you can also share videos of products on YouTube. Black Friday & Cyber Monday are the perfect events that provide various entrepreneurs with numerous lucrative opportunities to elevate their conversion rates along with their business growth. Hope these tips can help you to achieve your desired sales during this festive season. If you are seeking any technical assistance for Social Media Management, SEO, Content Management or Brand Integration, mail us at admin@bluestar-apps.com or call us today at 888-317-6959.